A duck-billed platypus of a bike. Named after a mythical beast that was half-horse/half-human, the Centauro was more half Quasimodo, half Pat Butcher. The bulky one-piece tank/body device cloaked a chassis which was a special blend of parts that – some people have rather cruelly suggested – should have been melted down into something much more useful. Like a skip. This bulk of a bike sat way too low at the back on a spring that didn’t, while the front end felt like it might crash-dive like a holed submarine if you so much as thought about stroking the Brembo front calipers. 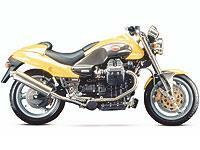 The fuel-injected engine was lively (as in rather unpredictable) on small throttle openings, while it also managed to vibrate more than every other Guzzi box in the history of jack-hammers.